Home events Urban Food Collective hits the South! The South has always been a venue that a lot of business owners seem to forget about. I don't know if its because we are too far or they think we have our own little world but I am happy to announce that THE URBAN FOOD COLLECTIVE will be hitting the South starting October to December 2014. Entrance is FREE so you have more moolah to spend on the products and whats good about this is that they will be selling ORGANIC and ALL NATURAL products which is a big plus for Moms like me. They even sent over a sample. Eeeekkkk! My son loved the cookie. He ended up eating almost everything except for two pieces which he gave to me. Hahaha. Upon biting into it, I understood why he liked it. It was chewy and it tasted really good. 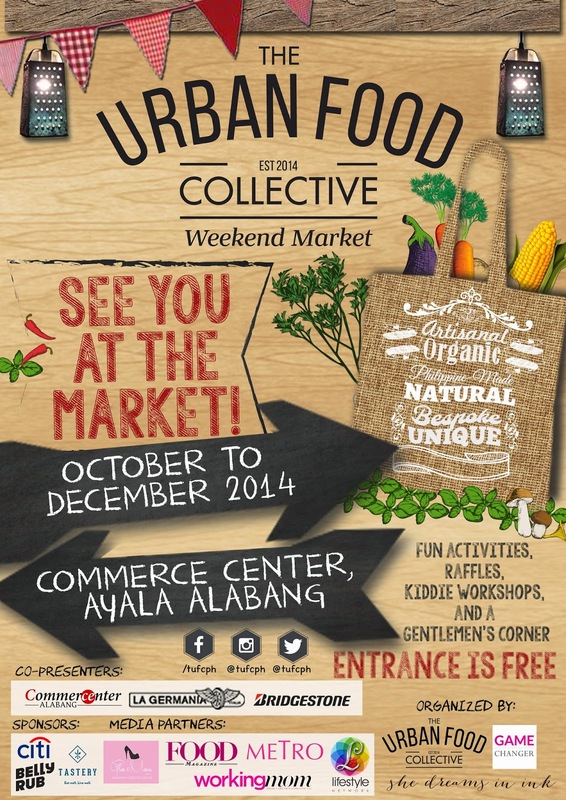 The Urban Food Collective Weekend Market is a carefully curated collection of purveyors. Located in CommerCenter, Alabang’s newest lifestyle mall, it is a place where people can comfortably gather, browse, and shop. It will be a venue for patrons to find a bevy of treasures from gourmet, specialty foods to local, artisanal arts and crafts. The Weekend Market’s activities and pocket events will give them the opportunity to learn new things or simply engage with the community. For purveyors, it will be an opportunity to showcase their goods to a truly discerning crowd, while providing them with a gateway to other business opportunities with The Urban Food Collective. Also recognizing its responsibility to society, The Urban Food Collective will donate a portion of the proceeds from the Weekend Market to the Taguyod Bayan foundation, helping rebuild communities affected by typhoon Haiyan in Sara Iloilo. See you at the market! Where you can find good food, good things, and goodwill. Follow The Urban Food Collective on Facebook - tufcph and @tufcph on Twitter and Instagram. san malapit to sis? s filinvest tent b? san to malapit sis? filinvest tent? Accacia Hotel :) Its near that place.